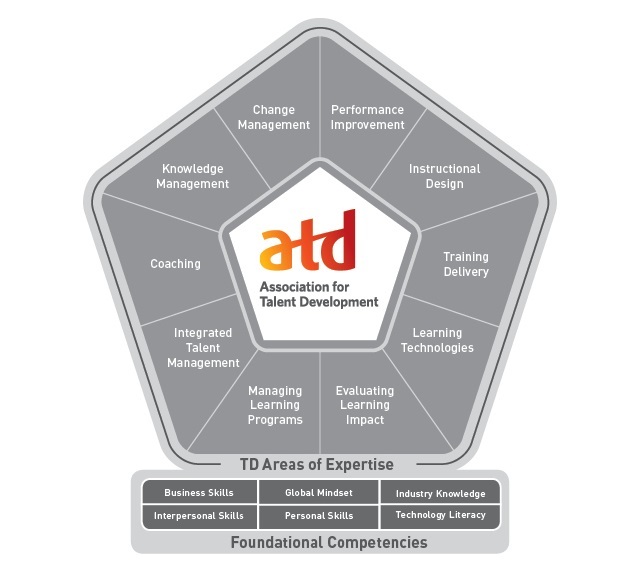 ATD launched an updated competency model in 2014. The ATD Competency Model defines the skills and knowledge required for talent development professionals to be successful now and in the future. It captures changes driven by digital, mobile, and social technology; demographic shifts; globalization; and economic forces. provides the opportunity to align individual and organizational goals against an industry standard backed by research and forward-thinking. The model emphasizes foundational competencies that are important to everyone in the field and specific areas of expertise (AOEs), which are the specialized knowledge and actions required by specific roles. Apply a systematic process for analyzing human performance gaps and for closing them. Deliver informal and formal learning solutions in a manner that is both engaging and effective. Use learning metrics and analytics to measure the impact of learning solutions. Capture, distribute, and archive intellectual capital to encourage knowledge-sharing and collaboration. Design and develop informal and formal learning solutions using a variety of methods. Apply a variety of learning technologies to address specific learning needs. Provide leadership to execute the organization’s people strategy; implements training projects and activities. Apply a systematic process to improve others’ ability to set goals, take action, and maximize strengths. Apply a systematic process to shift individuals, teams, and organizations from current state to desired state. Convey respect for different perspectives. Adapt behavior to accommodate others. Keep abreast of industry changes and trends.